Hero Images / Getty Images. When we move into a new neighborhood, building or city block, we always wonder who are our new neighbors. Finding the time to introduce yourself is usually left to chance. After a move, there's just so much to do that we often leave getting to know the neighbors until last, and more often than not, it's something we never do. Knowing your neighbors helps you get settled into the new neighborhood. Besides, you might just make some really strong, long-lasting friendships. We'll all busy and getting to know people in your neighborhood takes time. So, what I like to do is to mix our everyday activities into ones which may promote introductions. Instead of hanging out in the backyard, why not spend more time in the front yard? Whether it's reading a book or magazine, enjoying a glass of wine or trimming the hedge, being out in the open naturally leads to conversations with those passing by, coming home from work or leaving for the evening. This used to be the way houses were designed; a large porch in front for those warm summer nights where parents could sit and watch the neighborhood children (and their own), play. I think we need to take back our front porches and start rebuilding these social ties that are so desperately missing. If you don't have a front yard or a place to be outside, spend time on your balcony or a common space such as a neighborhood park or city bench. We moved into a new neighborhood and city last year. And like most people, we were swamped with unpacking, settling in and getting started in new jobs and schools. I was determined, however, that we would get to know the very diverse areas we had moved into. So, we set ourselves the task of shaking at least one new hand per week. We made it a priority on Thursday evenings to take a little something to a new neighbor's house (homemade jam, tea, plant cuttings to the gardener, etc...), introduce ourselves and have a small chat. I highly recommend taking just 15 minutes a week to shake one new hand. Whenever I ask people what's the best way to get to know neighbors, they always mention the infamous block parties. Since this seems like a huge planning nightmare (not my forte), I always shirk from the thought. 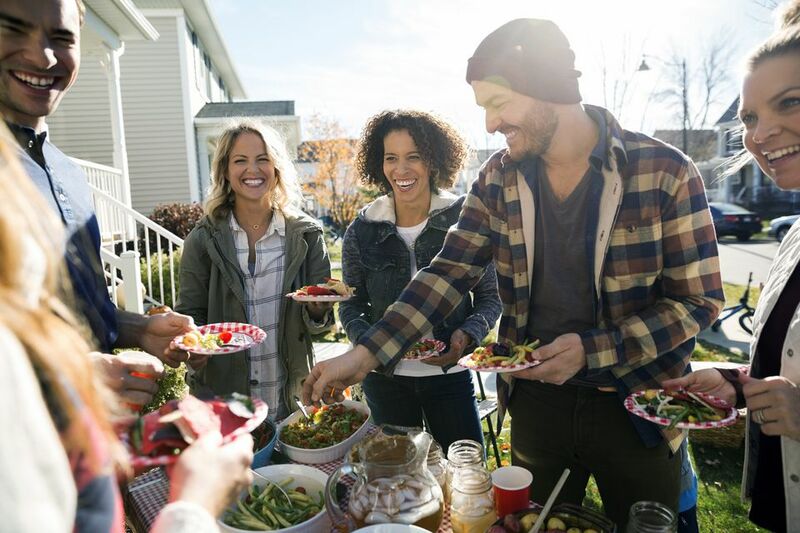 When I took a moment to rethink it, I realized the notion of a neighborhood party felt overwhelming because of the amount of food and stuff needed to fill all those hungry mouths. Instead, I offered our block an easy housewarming, "bring your own wineglass/beer glass" party. It was held in the late afternoon/evening and we served wine, beer, fruit juice and sodas, along with some crackers and cheese. Simple. Easy. Others have told me that they also host a picnic in the park, where everyone brings enough food for themselves, then they switch and share baskets. Another great idea that requires little coordination and effort. For many of us, time is so valuable that just thinking about doing any of the above suggestions, makes us feel overwhelmed, while others are more shy and introverted and couldn't possible partake in any of the previous ideas. For you (and me, too, sometimes), I suggest to simply try to get to know two neighbors. It doesn't need to be a formal get-together or a formal introduction, but just a gesture so that you have some kind of connection. You don't need to do much or to expend too much energy. Just a wave and a smile can make a huge difference.